The Aviación Naval Uruguaya (Uruguayan Naval Aviation – ANU)long experience dates back to the creation of the Naval Aeronautical Service on February 7, 1925 (the current name dates from June 27, 1952). C/A Atilio Frigerio, a Naval Officer who was the first military aviator in Uruguay, having obtained his brevet (number 116 of the Italian Aviation and 154 of the International Aeronautical Federation) on August 7, 1912 at the Military Aviation School in Aviano, Italy. Before the creation of the helicopter, several types of fixed wing aircraft of were utilised like the Italian built flying boats Cant 18 and 21. Following WW2 the US supplied TBM Avenger torpedo bombers during the late 40s, Grumman F6F Hellcat fighters, the SNJ Texan and the huge PBM Martin Mariner in the 50s, a period of plenty for the ANU. The first helicopters in the country, received in 1955, were bought for the Navy in the shape of the Bell 47G equipped for SAR operations, fitted with pontoons and two stretchers (three more were obtained in 1988, 1992 and 1995) . In later years more piston engined helicopters arrived from the US as two larger Sikorsky SH-34J and four CH-34C were delivered in 1971 and 1972 respectively alongside two Bell OH-13H for training. The turbine era arrived in the 1981 in the shape of a twin engine Bell 222 flown from the US. The fleet grew in strength and size with the addition of two British built Westland Wessex W-60 during 1991 (replacing the aging CH-34C) and five Wessex HC Mk II in 1997 from RAF Shawbury stocks in the United Kingdom. In 2006 the Uruguayan Navy acquired its first ship with a flight deck: The ROU 04 “Artigas” (ex A1413 “Freiburg” Luneburg class of the German Navy). This command and control platform, carrying a helicopter on its aft deck, allowed the service a greater range of naval power projection, more time on station on exploration, patrol, ship support and SAR missions as well as a faster action time provided by the air assets. The problem was that the force did not have a suitable aircraft to operate from the ship. The Wessex, provided excellent results but were too large for landing on the deck of ROU 04. On initial purchase in 1997, it was estimated that these aircraft would be operational for five years and in 2010 Armada 081 was still flying as the last Wessex in military service in the world! The privilege of being the first Uruguayan naval helicopter to land in the “Artigas” was granted to a Helibras AS 355F2“Esquilo”donated by the Brazilian Navy (Marinha do Brasil/MB). This Brazilian built version of the twin Eurocopter “Ecuriel” (Squirrel) designated UH-13 by the MB and Esquilo Biturbina by the ANU was received on October 26, 2006, registered as Armada 071 and put to service on the 2007 Uruguayan Antarctic Operations, named “Antarkos”. On July 23, 2007 six helicopters MBB (Messerschmitt Bolkow-Blohm GmbH, now Eurocopter) BO-105 PAH-1 arrived at the port of Montevideo, from Bremen, Germany. Bought for € 1.8 million (£ 1.3 million) was an excellent opportunity for the ANU. They were transported by road to the ANU’s main base, Base Aeronaval No. 2 C/C Carlos A. Curbelo (BAEN 2), near the Mediterranean resort of Punta del Este and enrolled as Armada 061 to 066 on the Escuadrón de Alas Rotatorias (Rotary Wing Squadron). Their intended use would be very different to that given by the previous user, the Air Regiment of the German Army (Heeresfliegerregiment)who came to acquire 212 units delivered until mid 1984. In Europe, the highly maneuverable, light twin-engine BO 105 PAH-1 (PanzerAbwelrhubsHrauber – Anti-Tank Defense Helicopter) were flown over the ground, hunting armored enemies with their six tube (three on each side) cable guided anti-tank Euromissile HOT missile. The missile launchers racks have been removed however the reinforced frames on the back side of the fuselage that held the weapon system is still visible. Small in size, mostly built of composite materials the BO-105 earned a reputation for performance and reliability; making it the ideal light helicopter: twin engined, compact size and a rigid main rotor. The latter allows the aircraft to perform aerobatics, makes it agile and highly maneuverable. It can be folded (must be done with wind speeds above 45 knots), reducing on board space and flutter damage to the rotor under rolling and pitching of the ship in rough seas. The PAH-1 model, antitank version of the model M, has reinforced transmission and main rotor components, higher thrust on the tail rotor, a sturdy fuel system and the skis can absorb higher energy levels during hard or emergency landings. This is important on ship’s operations as the landing are harder on helicopters fitted with skies, than with tyres. Its two turboshaft engines, MTU (Motoren-und-Turbinen-Union) 250-MTU-C20B weighting 156 lb (71 kg) each develop 420 shp of power, suitable for most missions even whilst the aircraft is at its MTOW of 5500 lb (2500 kg). Retained by the ANU, is the BAE Systems Doppler AN / ASN-128navigation system. Similar to an INS, but of lower cost, is suitable for flights over land, but not so for over water missions; it cannot obtain sufficient contrast between different materials in a maritime environment. Its operation resembles that of a VOR / DME, being self-contained, provides jam-resistant navigation and does not require external NAVAIDS – such as VOR / TACAN of military ships (absent in the Uruguayan Navy ships). 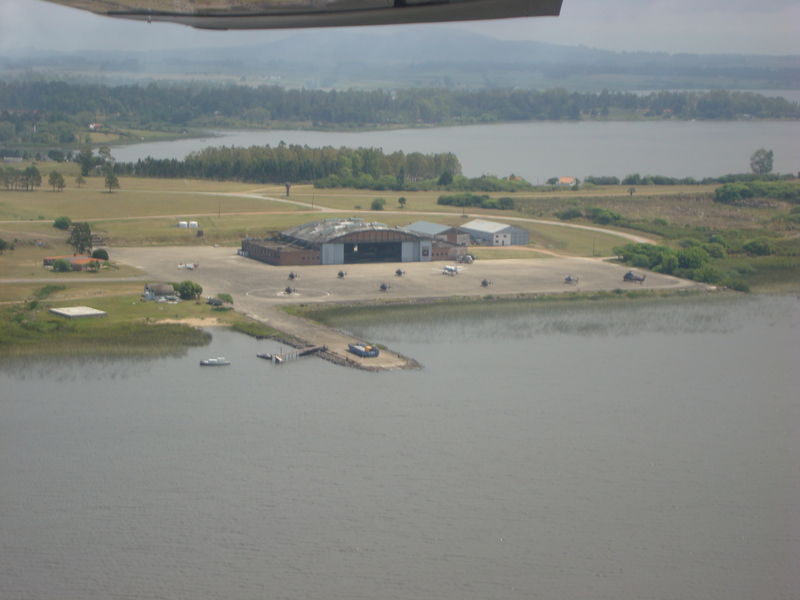 Uruguayan pilots also appreciate its accuracy (0.1 of a nautical mile on a 150 NM flight, for example from their base near Punta del Este to Fray Bentos in western Uruguay). The high sensitivity and accuracy of its “hover mode” increases safety during ship operations with marginal weather conditions. All these features, plus the ability to fly an adapted terrain profile (nap-of-the-earth) make the practical and stealthy BO-105 a favorite for Special Ops with the FUSNA (Fusileros Navales/Marines). Benches can be installed on each side of the helicopter capable of carrying three riflemen on each side. Counterterrorism training missions are conducted, in which special forces SECRON personnel (Sección de Reconocimiento- FUSNA/FUSNA Reconnaissance Section)descend via Fast-Rope to passenger ships. The type German past is evident everywhere: A rectangular extension on the left roof use to harbor a stabilized telescopic gunsight system, a “dimmer” shooting reticleis found left of the co-pilot seat, both systems used to launch missiles, plus German call sign markings in the cockpits. In the words of an Uruguayan pilot, these features were not removed “out of respect” for the German service. The excellent quality camouflaged paint scheme remains – for practical and economical reasons – with the variation of a high visibility fairingpainted in DAY-GLO style for naval operations. One Apical Industries Inc. flotation systems / emergency raft was installed on skis. Supplied in kit form, it contains three helium/air pressurized containers, floats, raft and connections. If the aircraft is in distress, system activation (including rafts for the crew on both sides) is performed by a red lever in the cyclic column of the aircraft commander (right seat) a mixture of air and helium inflating the flotation system. Activation can be also be done by an alternative cam from the right floor by the Winch Operator (Contramaestre in Spanish) or externally by another cam near the rear right ski. For Medevac missions the rear cabin has room for two side by side stretchers, following removal of the three rear seats. Whilst flown by the Herr this area held an electromechanical rack for the HOT anti-tank missiles.The BO-105 lacks a rescue winch – limiting maritime SAR operations – on a not so ideal for the task aircraft due to its small cabin and payload capacity. The rescue winch asking price price of € 150,000 (£ 108.500)required by Eurocopter, it is considered outside the service’s budget in the present financial climate.The ventral winch is certified for weights up to 1323 lb (600 kg), but limited to 551 lb (250 kg) due to the restricted weight capacity of the aircraft. VERTREP missions (Vertical Replenishment) lowering cargo onto the aft decks of the Uruguayan Navy frigates are regularly carried out as well as practising the carrying the oil spill response system Simplex 6860-701 to avoid a man made catastrophe in the country’s waters. The basic weight of the BO-105 (varies slightly between aircraft) is 3065 lb (1390 kg). 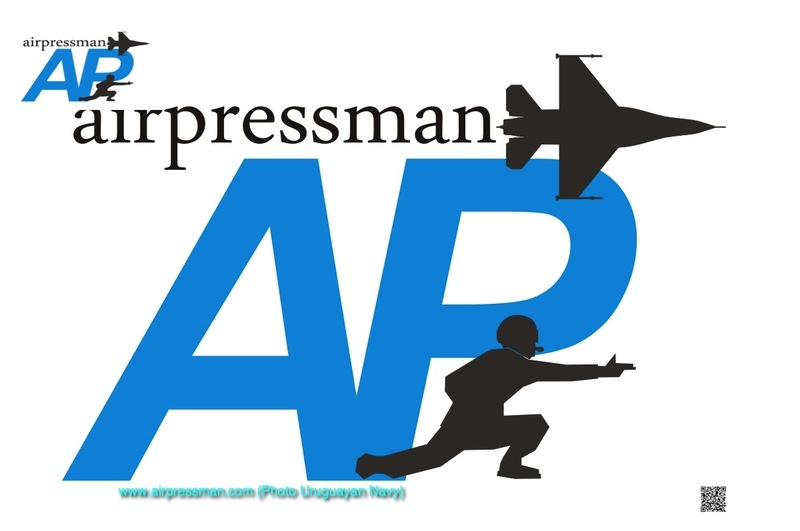 If we calculate 661 lb (300 kg) for a three-man crew (pilot, copilot and boatswain, including helmets and survival equipment), 937 lb (425 kg) per 560 liters of JET A1 fuel, the total of 4663 lb (2115 kg), would only leave us with useful payload of 849 lb (385 kg). During SAR missions, the seats aft of the pilots are removed as the weight context becomes critical, if we add a rescue swimmer to the crew. Meanwhile, the ANU in addition to continue to fulfill – with meagre resources – its duties within the Navy, namely operating alongside the Prefectura (Coast Guard), in diverse tasks as safeguarding life at sea, SAR, maritime patrol, surveillance and control of territorial waters, supply and support the surface ships and ground infantry forces of the Fusileros Navales/FUSNA (Marines)must also qualify and keep aircrews current to operate the BO-105 on board the ROU 04. The training challenges here were many, as the service never operated a ship with a flight deck before. Type training of a few Uruguayan Navy flight instructors and technicians was conducted both in Spain (with the FAMET -Fuerzas Aeromóviles del Ejército de Tierra/Army Aeromobile Forces) at the BHELA I squadron (Batallón de Helicópteros de Ataque I/Attack Helicopters Battalion I at Almagro, Ciudad Real) andGermany (Immelman Air Base at Celle, Saxony). Training had to be designed and adapted to the new reality. A training plan borrowed from the Mexican Navy (which flies BO-105CBS) was analysed. Large ships like the ROU 04 generate mechanical turbulence to an approaching/departing aircraft from her superstructure and stack; approaches to land had to be perfected, three are practised, however the preferred one being the so called “a la inglesa” (“english style”)Harrier VTOL style. Namely it calls for the helicopter to approach port of the ship (the aircraft commander sits on the right seat) – avoiding the previously mentioned turbulence – and side-stepping on an oblique flight path to the deck. It provides a good view ahead of the natural horizon but most importantly a clear way ahead in case of trouble. Take offs are carried out with plenty of power and a sharp, positive departure is needed, as to avoid a rolling deck hitting the airborne aircraft. 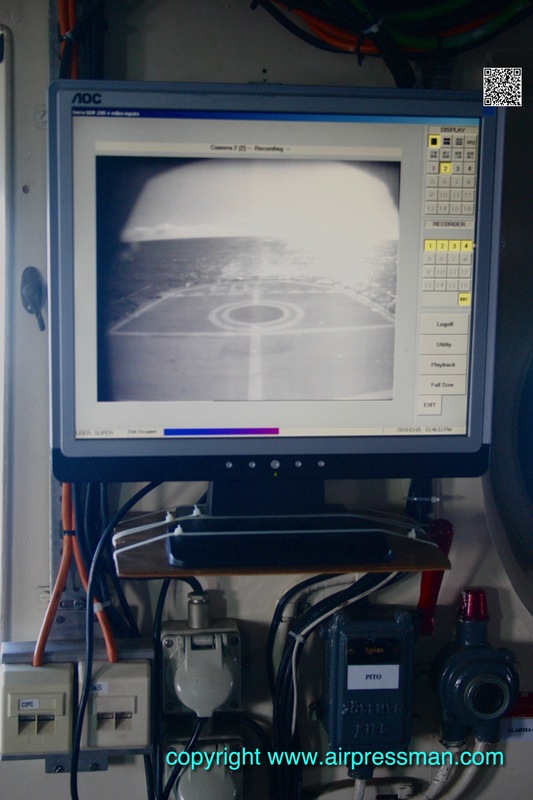 Further investment was carried out at the BAEN 2 in the way of a tarmac copy of the ROU 04 flight deck, constructed to simulate take offs and landing on the ship. The tarmac square is found adjacent to the old flying boats ramp leading to the Laguna del Sauce, the beautiful lagoon surrounding the Naval Air Station. Also, the HUET (Helicopter Underwater Escape Training)previously carried out overseas – usually in Brazil – is now done in-country, on an indigenously built tilting helicopter cabin, located within the service’s Grupo de Buceo (Diving Group) in Montevideo. Furthermore, the force had no flying experience inextreme cold weather conditions and the assistance of the Argentine Fuerza Aeronaval was sought, and training in snow operations carried out near Bariloche in southwestern Argentina, near the Andes mountains. The binomial ship-helicopter is part of a recent maritime strategy to maintain a sustained and longer presence in the territorial sea areas, also acting as a deterrent to illegal fishing. The nation awaits a positive verdict, after conducting two separate, expensive studies to detect the extent of its continental shelf, after requesting to the United Nations (UN) an extension of the Exclusive Economic Zone (EEZ) from 200 to 350 nautical miles from the Uruguayan coast. The UN decision was expected for 2016, if successful, Uruguay would then have jurisdiction over a platform and subsoil up to 39.000 square miles (100,000 square kilometers). There are indications of the presence of oil and gas in the Uruguayan continental shelf (Punta del Este Basin) about 108 nm (200 km) from the coast. Exploration by several european oil companies commenced in early 2016; at time of writing the french company TOTAL is expected to publish results of recent drilling. By international agreements, the country has assigned the SAR area of responsibility called Atlantic South West Zone 5 – a segment that limits its eastern end with the area of responsibility of South Africa. It represents an area of 683.400 square miles (1.770. 000 square kilometers) or about ten times the size of Uruguay. Protecting this large zone is an impossible challenge to meet with the current surface fleet and aerial units, including those of Uruguayan Air Force (FAU) with which responsibilities are shared. But it is a start to have the BO-105s, which in the future could operate onboard retired German F122 Bremen class frigates that Uruguayan authorities have shown an interest to German command. These ships have the capacity of carrying two helicopters of small size, alongside a maintenance hangar, able to refuel the helicopters and safe keeping of the second unit; features unavailable on the ROU 04 Artigas. A more realistic option gaining pace, would be the incorporation of three Off-Shore Patrol Vessels (OPV). During April 2015 Uruguayan Naval officers travelled to Asia visiting Brunei and China to observe the Lurseen OPV 80 and the P18N, built in Brunei and China respectively. The German built Fassmer OPV 80 and the French DCNS L’Androitare also being considered. From 20 July 20 to 6 October, 2008 the BO-105s departed for their first overseas and ship-pairing mission: PANAMAX / HAITI 2008. Held in the city of Colón in Panama, BO-105 Armada 062 operated from the deck of the ROU 04 Artigas during this multinational exercise PANAMAX. The navies of 19 countries participated with 50 ships and 40 aircraft, performing asymmetric threats tasks, and missions to ensure free flow of maritime traffic in the Canal Zone and neutralization of terrorist attacks. “Cross-Deck” flights were carried out, where the helicopter lands in all vessels of the participating navies; namely Brazil’s “Liberal”, Colombia’s “Independiente” and the US Coast Guard cutter “Harriet Lane”. Next stop was Port au Prince (Haiti) to replenish the Uruguayan peacekeeping contingent stationed there as part of MINUSTAH (UN Mission for the Stabilization of Haiti). Without warning the mission became a humanitarian aid one: The port city of Gonaives north of Port-au-Prince was devastated by the passage of Hurricane Gustavwhilst Hannah was threatening not far behind. The Armada 062 made a total of 16.4 hours of flight in this deployment, conducting photo reconnaissance missions (seeking harbors and ports of possible use), open fields for landing zones (LZ) and then proceed to deliver food and water to isolated areas. At the end of the tour 78 people of various nationalities were rescued. On top of being the first ship-pairing mission, the ANU had the satisfaction of obtaining from Naval Authorities, the “Badge of Efficiency” distinction, and its award badge painted on the aircraft’s fuselage. During March 5, 2010 the ROU 04 left once more for Haiti in a mission to support this nation devastated by the recent earthquake. The ship carried goods from Argentina (at the request of that nation’s government) and Uruguay, as well as the locally invented and built UPA (Unidad Potabilizadora de Agua/Water Purifying Unit) a simple, cheap to run device, that was installed on Morne Cassé (Fort Liberté). 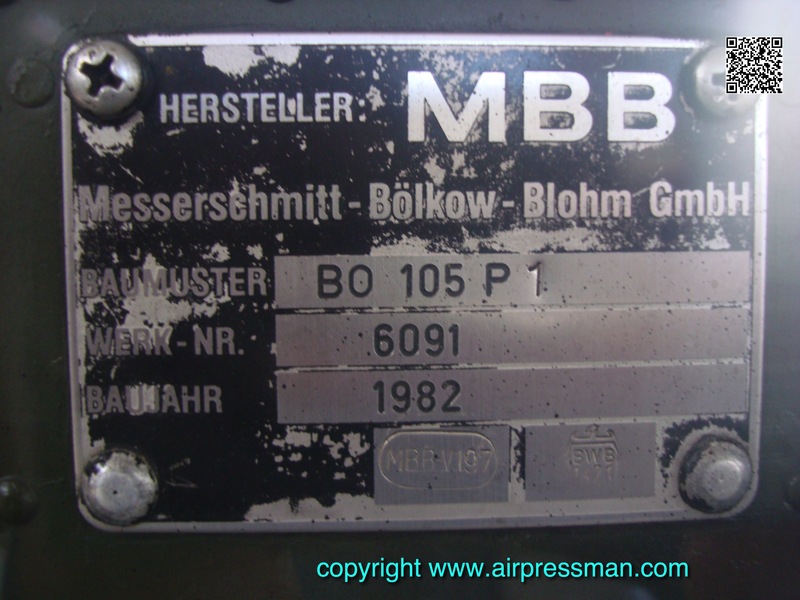 The BO-105 aboard this time was A063. The mission returned to Uruguay on June 10 having achieved over 40 hours of flight in cargo, photographic and medevac missions. During summer time in the southern hemisphere a BO-105 sails onboard the ROU 04 heading towards the icy waters of Antarctica. The destination is the Base Científica Antártica “Artigas” (BCAA/Artigas Antarctic Scientific Base) operational since 1984 in the King George Island (South Shetlands) 54 nm (100 km) north of the Antarctic Peninsula and 540 nm (1,000 km) south of Cape Horn (62º 11´4´´ South latitude, 58º 51´7´´ West longitude). The base provides logistics support to research and scientific projects of the Instituto Antártico Uruguayo/IAU (Uruguayan Antarctic Institute) and maintain a national presence in the white continent. With the ROU 04 anchored in the Collins Bay 300 mt opposite the base, base re-supply and waste disposal operations begin, utilizing the BO-105 ventral winch.Crew carry out tasks expeditiously as in this cold and hostile region weather conditions change suddenly, with severe storms, icing conditions, katabatics winds being a regular feature, as is the hazard of bird strikes. Large birds like Albatross and Petrels are attracted to the base (and helicopter lights!) specially during the rubbish removal taken to the ship by helicopter, as no refuse can be left in the White Continent. During Antarctic operations the crew wear MK-10 immersion suits, and a HEED emergency scuba equipment (Helicopter Emergency Egress Device) to breathe underwater. If flights away from the ship and the BCAA become necessary, they are limited to 20 nm (37 km)from the area (the vessel does not have VOR / TACAN) to reduce the danger of “whitening effect” (loss of visual contact with the natural horizon due to high reflection) and the momentary loss of communication on low-level flights. 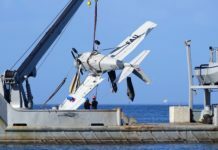 The operation of aircraft in a hostile environment like the sea, in different weather conditions and from a mobile platform like a warship, is risky and requires high qualifications of all crews. Besides operating from the ROU 04 when the opportunity arises Uruguayan air crews prepare to qualify for operations in Allied ships. To maintain currency each crew must perform a minimum of four “touches” (landings) in a vessel within six months. During a recent Southern Partnership operations with US Navy ships, BO-105s landed on the USS Oak Hill (LSD 51) a Harpers Ferry-class dock landing ship as well as working together with the Ticonderoga-class cruiser USS Bunker Hill (CG 52) during the visit of the aircraft carrier USS Carl Vinson (CVN 70) to the waters of the Rio de la Plata in operation Southern Seas. Before the aircraft was certified to fly with the ventral sling hook and the emergency flotation system, the effect that both modifications and consequent weight gain would have on the aircraft handling was analyzed. For example, the sling hook, the same used in civil helicopters of this size but not designed for the BO-105, was not to brush against the floating system. 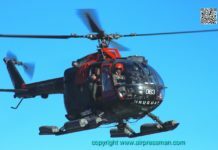 A removable ELT was installed in the co-pilot’s seat back, Garmin Trimble 2000 GPS systems were fitted in three BO-105, after being “cannibalized” from the decommissioned Wessex HC Mk II fleet and encrypted Motorola naval communication (VHF / FM) systems fitted to all aircraft. Still present in the cockpits is the threat warning panel, providing indication of the location of a (civil or military) radar that “illuminates” the helicopter. Future improvements could include the installation of VOR / DME / ILS equipment for IFR operations, a “Tilt Mode” weather radar, and filters over the cockpit’s communication and navigation equipment, for the use of NGV (Night Vision Goggles). This modification has been carried out on the service’s only AS 355F2 Armada 071 for the utilization of the ANVIS-9 system. The ROU 04 itself was under analysis, as among other things, the correct porosity of the surface of the deck and the maximum weight of the aircraft that it could hold (up to 5511 lb/ 2500 kg) had to be determined. The BO-105 has added more capabilities to the Uruguayan Navy, however the type cannot match the performance and load carrying capabilities of the ancient Wessex that it replaced. 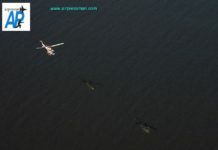 What it does well is to qualify rotary wing pilots in a simple aircraft to fly at lower costs, and the greater availability of aircraft, allows the ANU to task them on photographic and liaison missions as well as to become the current “flagship” of the Uruguayan Naval Aviation on ship borne operations. However, during mid 2016, the whole fleet is grounded – awaiting spares and major maintenance – with the exception of Armada 066 (c/n 6142, ex Heer 87+42, built in 1983) with approximately 25 flying hours remaining, (end of July 2016) before a major overhaul is due. Necessity being a great creator of resources, the ANU plans to exchange some turbine modules from out of service engines into the A066, as to be able to extend its flying for another 150 hours. Naval sources state that there is no money allocated for these overhauls nor they have any idea if and when the monies might become available. To make matters worse, on the single AS 355F2 “Squirrel” (Armada 071) helicopter, metal chips were detected on one of her engines – no spare engine is available – thus it is also grounded, awaiting for funds for the repair. In the meantime the Uruguayan “Fleet Air Arm” counts on the political decision – always extremely slow to come by in these latitudes – to acquire three OPV (Offshore Patrol vessels) designated by the navy’s Comando de la Flota (Fleet Command) as of a high priority to fulfill its duties. These ships have an aft landing deck, therefore three helicopters will be required to operate from them. The helicopters options being assessed are the Agusta Westland Aw109 and Aw139, the Bell 412EPI and the latest option, the Harbin Z9 (a chinese built AS365 Dauphin). The Aviación Naval Uruguaya – one of the most powerful in the continent in the 1950s – must remain focused on the tasks at hand, whilst awaits for the new aircraft and ships to operate from, bringing new duties, responsibilities and challenges; to be able to fulfill its missions in an adequate manner, from modern, contemporary ships and aircraft, but most importantly apt for the maritime needs of the nation. Previous articleRaging Fire! Air Force and Naval rotary wing assets and civilian aviation to the rescue!